Today followed a rather busy weekend. I am finally feeling more human than I did last week though. I spent a vast majority of the day in my studio, working on finishing up an edition for the Assemblage project at MCBA. Earlier I had been working on printing around 140 prints of this image. 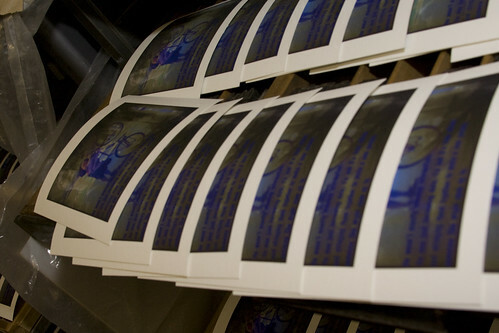 Today I was working on printing the dialog on those images. I start with mixing ink in a color that will accent or work with the colors of the image. I chose blue for this one. Last week I did manage to get the dialog for this image typeset, which made my day today go a bit faster. 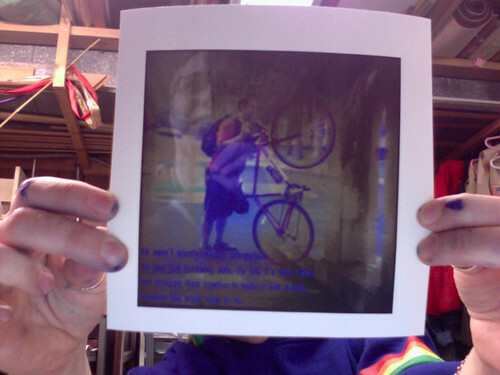 After getting the ink mixed, the rollers put on the press, and everything put in place, it only took me a few tries to get the image and words lined up the way I wanted. 140 prints later, I was finished! Ok, really, it did take me quite awhile today to get this done. Each image took a little bit of adjusting. No two prints are quite exactly dead-on identical. I don't see that as a flaw though. I see that as one of the reasons I love analog processes. Things can be similar, but in some way will always be unique. I left the prints out to dry overnight. I'll see how they are doing when I go back tomorrow. 125 of these will go to MCBA, and 5 will be left for my show next September. 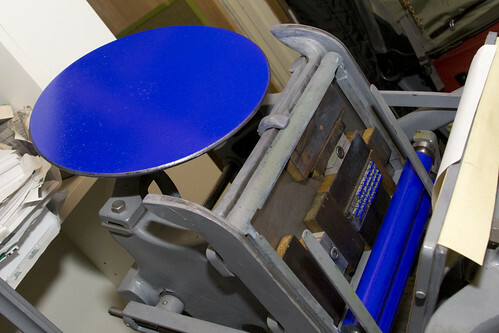 I do love how my press looks with ink on it. 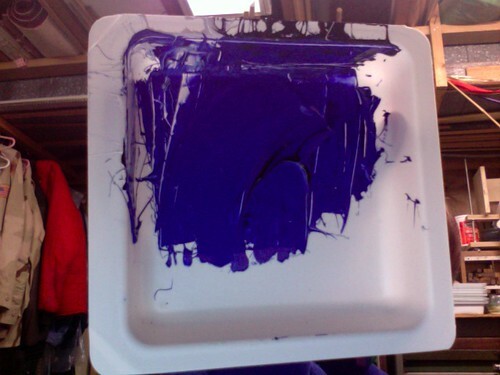 Of course some of my fingers are also that same color blue…. 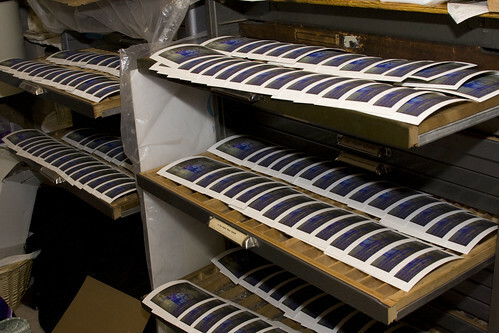 The last thing to do with these prints will be to sign and number the edition. Hopefully, the ink will be dry and I'll be able to do that tomorrow, and drop off the edition where it needs to be on Thursday, actually 2 days early!